Practices of aquaculture production may generate potential pollutants that cause environmental pressure. In this context, a recommendation to mitigate the environmental impacts caused by aquaculture waste would be using and recycling such nutrients, considered as “pollutants,” in an eco-efficient way, with approaches such as the integrated multi-trophic aquaculture (IMTA). This system integrates the culturing of organisms with different and complementary ecosystem functions. This study aimed to investigate the ecosystem capacity of Ulva lactuca in wastewater bioremediation in an IMTA system with mussel and fish effluents. For such, three systems were set up: (1) algae cultivated with seawater, (2) algae with effluent from fish, and (3) algae with effluent from fish and mussels. Ulva lactuca proved to be a suitable species for the IMTA system with high growth and easy handling in cultivation. 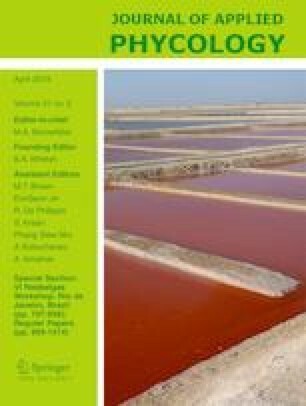 Algal growth rate, nutrient uptake (N and P) and O2 production increased significantly as the succession of trophic levels increased, demonstrating the high ecosystem capacity of U. lactuca for wastewater bioremediation as well as the use and recycling of eutrophication agents for biomass production. The highest absorption/removal of dissolved nitrogen occurred in the form of NH4+, a N form with the greatest metabolic advantage for photosynthetic assimilation, but toxic in high concentrations. The present IMTA system showed a balance between inputs and outputs, denoting sustainable and efficient characteristics of several ecosystem goods and services. The first author thanks Daniel Eduardo Lavanholi de Lemos for the infrastructure facilities, Luis Felipe de Freitas Fabrizio and Ricardo Otta for help in the construction and maintenance of cultivation systems, FC thanks CNPq for the productivity fellowship (Proc. 303937/2015-7).